Man of Steel soundtrack is first DTS Headphone:X release | What Hi-Fi? The soundtrack to Man of Steel, produced by Hans Zimmer, has become the first film soundtrack to be released using the new DTS Headphone:X codec. The new DTS virtual surround sound technology aims to recreate the surround sound experience in standard headphones. 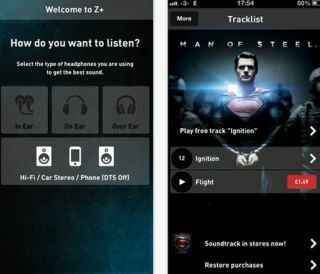 You can listen to the DTS Headphone:X soundtrack using the Hans Zimmer's Z+ Music app or by buying a deluxe CD copy of the Man of Steel soundtrack. The deluxe CD version comes with a special code allowing for one free download of the soundtrack within the Z+ Music app. Still a relatively new technology, DTS Headphone:X aims to recreate a surround sound experience with regular headphones: "a Home Theatre in your pocket for mobile audio", as DTS describes it. DTS says the app allows the producer to "capture the acoustics" of a studio, so when Zimmer used multiple drum kits placed all around a microphone, the Headphone:X technology should bring this to life in your ears. Pretty neat, eh? Zimmer says: "With the Man of Steel soundtrack, I wanted to try something new and give fans the opportunity to connect with characters and completely immerse themselves in the emotion and action of the movie in a way that's never been done before. "Every bit of the music is accurately recreated, allowing fans to hear all elements of the soundtrack, exactly as I heard it while producing it."